We all love a delicious breakfast, especially on holiday mornings or special occasions, but sometimes we love sleeping in, too. That's where make-ahead breakfasts come in! There are plenty of delicious recipes that can be prepared ahead of time, so you can enjoy your sleep, then wake up and enjoy the scrumptious flavors and heavenly cooking smells of a satisfying breakfast that can be ready in just minutes. So if you're looking for easy breakfast ideas, check out this winning round-up of our absolute favorite overnight options. From breakfast casseroles to breakfast burritos, irresistible breakfast pastries—and more—await you. Who among us can resist the ooey, gooey sweetness of homemade cinnamon rolls? 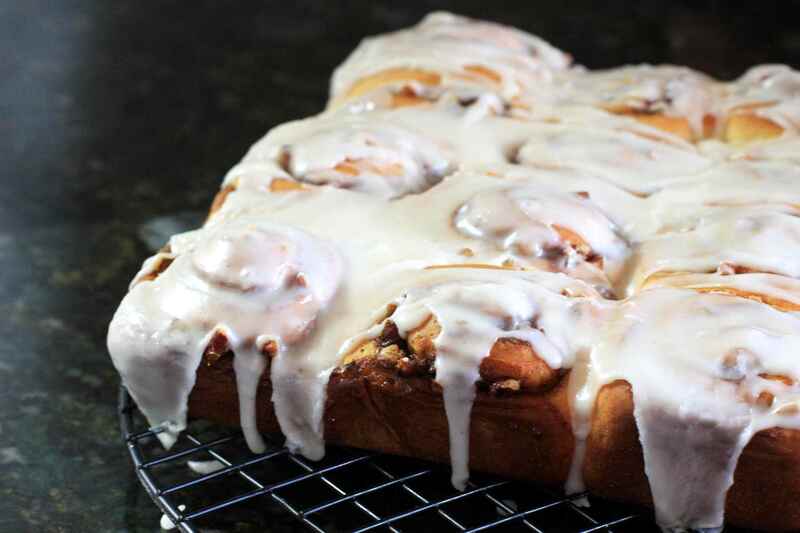 These amazing, soft and buttery cinnamon rolls, iced with a delicious, finger-licking cream cheese frosting, are perfect for serving on holiday mornings or for a special family breakfast. Make them ahead of time and freeze for up to a month, until you're ready to bake them. Then spread the easy cream cheese topping over the warm cinnamon rolls and enjoy! Who wouldn't love to wake up to the scrumptious, sweet, spiced flavors of carrot cake? This delicious, good-for-you carrot cake oatmeal recipe tastes just like eating dessert for breakfast, while delivering all the goodness, protein and fill-you-up fiber of old fashioned oats. Best of all, it's probably one of the easiest make-ahead breakfasts you could think of! These oats require absolutely no cooking and you can make a full week's worth over the weekend. We can't imagine a more heavenly breakfast than this yummy baked French toast that will fill your kitchen with an absolutely amazing, mouth-watering aroma. Baked French toast is so easy to prepare the night before, and you've never had moister, fluffier results. Classic brown sugar streusel topping adds wonderful crunch and extra sweetness to this breakfast or brunch recipe. Simply pop this make-ahead casserole into the oven in the morning, for a quick bake before serving. Makes a perfect holiday breakfast, or a treat for friends who've stayed overnight. Want to wake up to the delicious smells of a farmhouse breakfast cooking in your kitchen? This make-ahead crockpot recipe lets you cook a classic, hearty breakfast while you sleep. This allows you to wake up to a hot and comforting breakfast casserole that's loaded with the tasty flavors of tater tots, Canadian bacon, onion and egg. This is a great recipe to serve when you have people staying overnight at your house, or if you're hosting a holiday brunch. This fantastically elegant make-ahead recipe is just perfect for Christmas, New Year's, or Mother's Day morning, because all you have to do when you want to eat is assemble and bake. Rich, decadent, creamy scrambled eggs prepared with cheese and bottled Alfredo sauce are nestled inside beautiful, golden puff pastry shells that are super easy to make, using plain old muffin tins. You can prepare this dish up to two days ahead, then pop into the oven a half hour before serving, for a delectable breakfast that's sure to impress. Corned beef and spinach combine with cheddar cheese, eggs, milk, onion, nutmeg and Dijon mustard in this savory, satisfying overnight breakfast casserole that is perfect for serving a hungry crowd. Assemble this easy recipe the night before, then pop it into the oven in the morning for a holiday breakfast or brunch casserole that will keep your family and friends coming back for more. When you're craving sleep in the morning and an easy breakfast, but don't want the same old cereal or toast, here's a quick and simple make-ahead recipe that delivers tons of flavor and protein, and adds a nice change from the usual routine. Mexican-style breakfast quesadillas loaded with black beans, eggs, cheddar and taco seasonings are super easy to put together ahead of time. Just assemble by wrapping each quesadilla individually for freezer storage, then pop into the microwave (or heat quickly on a pan for a crispy finish) when you're ready to eat. Have you ever dreamed of waking up in the morning to a stack of golden, fluffy light waffles? Make that dream a reality with this genius gluten-free Belgian waffle recipe. These waffles are so easy to assemble the night before and cook on the griddle, and come out extraordinarily light and crisp. Keep a batch of the batter in the fridge for fast, delicious gluten-free waffles anytime you're craving the taste of carbs. You can top these sweet breakfast waffles with fresh fruit or maple syrup, or drizzle them with chocolate sauce and cool whipped cream for an extra indulgent treat. Buttermilk biscuits for breakfast are a comforting taste of home that's so welcome any time of year. You can prepare these biscuits ahead and freeze them on a baking sheet for up to two months, until you're ready to pop them into the oven and enjoy the taste of homemade buttermilk biscuits. They come out just as good as if you just cut them and baked them fresh. Kids and adults alike can enjoy the nostalgic taste of PB&J, in this delicious make-ahead breakfast that combines your favorite sandwich flavors with the nutritious goodness of old fashioned oats. Easy to make ahead of time and enjoy in the morning with no cooking required, you can also pop these yummy oats into the microwave for a quick and easy, tummy-warming treat. Make a batch the evening before and let the kids help themselves to breakfast in the morning, while you sleep in! Sausage lovers, here's a pre-made breakfast that delivers plenty of flavor in a filling casserole that's a bit healthier than the typical pork sausage bake. This flavorful brunch or breakfast casserole uses chicken sausage and chicken seasonings, for a hearty, homemade breakfast egg and meat bake that's perfect for a family breakfast or holiday brunch. 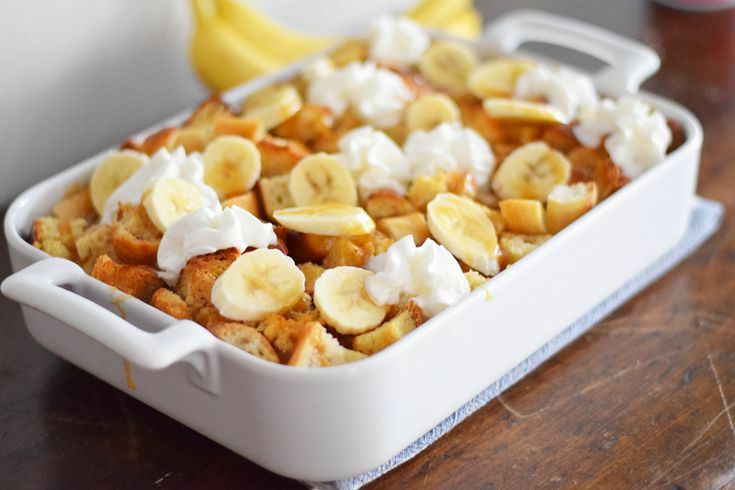 When you're looking for a make-ahead dessert to impress guests at brunch, or a super-decadent breakfast treat to serve to visiting relatives at the holidays, look no further than this unbelievably sweet, creamy, rich and delicious Bananas Foster French Toast Casserole. Inspired by the famously decadent dessert that originated in New Orleans, this French toast casserole version has all of the same amazing flavors, but is geared to breakfast and can be easily made at home. Just throw this recipe together the night before and pop it in the oven in the morning, for a warm, fragrant and delicious holiday breakfast or special occasion breakfast weekend brunch that everyone will enjoy. Elegant and colorful, this beautiful quiche dish also reheats beautifully, making it a perfect make-the-night-before brunch or lunch recipe when you're expecting guests. The classic flavor combination of asparagus, mushrooms and tomatoes is delicious and looks lovely on any table. Use a store-bought frozen pie crust and frozen steamed asparagus to make the preparation even easier. Simply reheat when you're ready to serve, for an impressive dish your family and friends will appreciate. Spanish-style empanadas are little stuffed pastries that make a delicious, savory on-the-go breakfast when you make them with breakfast fillings. Make these yummy, cheesy breakfast empanadas with bacon and eggs when you have time on the weekend. Then freeze them individually to warm up easily in the microwave or toaster oven on busy weekdays, when you're in a hurry but craving something more interesting than the usual toast or cereal for breakfast. Kids love these tasty breakfast empanadas too. Best part is, you can get creative with the fillings to suit your family's tastes (ideas included in the recipe)! Bacon, eggs, and hash browns make a fantastic, filling, family favorite breakfast combination. You can make these delicious and easy-to-prepare breakfast burritos with hash browns and bacon whenever you have time, and store them in the freezer, for easy reheating in the microwave. Kids love these yummy little roll-ups, which are perfect for breakfast on busy school mornings, as well as for parents on the run!